I have been beading for a while and more I bead more I am getting hooked on this absolutely amazing hobby. I love Czech Glass Beads, all CzechMates, SuperDuos, 2-hole Silky and new 2-Hole Honeycomb beads. Recently I have made Honeycomb Beezzzz Bracelet, designed by Akke Jonkhof. I made it in several colors and I absolutely love these bracelets. They are very easy to make and very comfortable to wear, and of course make a great gift. Aren’t these 2-hole Honeycomb beads adorable. They are also quite affordable. Click on a banner above to see the entire selection. A free pattern is available for a download at Eureka Crystal Beads. In between my beading I started reading about the history of glass making in the Czech Republic, I was fascinated, not only does it explain the common looks, colors and finishes of the Czech beads that we know and love, but how they came to be. Czech glass, also known as Bohemian glass or Bohemian crystal, is a decorative glass made in Bohemia and Silesia as far back as the early Bronze Age. There, in early middle ages, Bohemian glass workers discovered that combining the naturally occurring potash (potassium carbonate) with chalk created a very clear, colorless glass that was of much better quality than the glass being made in Venice, another traditional glass-making center. During a period of industrial revolution, Bohemia became specialized in the creation of Pressed Glass and Firepolish beads. Pressed Glass beads are made by pressing molten glass into a ready mold, leading to the vast variety of shapes available. The most popular are Czech Glass Leaves, Rose Petals, Czech Glass Bell & Trumpet Flowers. Czech glass Firepolish beads on sale are made from round pressed beads (druks) and then have facets cut into them by a grinding wheel, they are then heated in special ovens in order to smooth out edges, giving them distinctive brilliance and shine. Get them from Eureka Crystal Beads. Shipping is fast and free – and now you can get them in bulk at a very low, wholesale price. Firepolish beads have been the most popular beads for a long time. They are still popular and Eurekas’ best sellers. 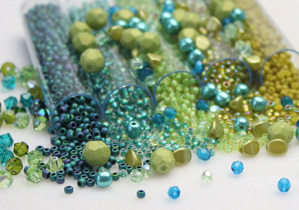 Recently however the entire beading industry has been dominated by a new development – Czech beads with multiple holes. There is a large number of shapes and colors available in Czech Glass 2-hole Beads, and two styles in 4-hole beads called QuadraLentils and QuadraTiles. See Eureka Crystal Beads for the largest selection of Czech Beads…don’t forget to visit free beading patterns for 2-hole czech glass beads, you may like more than the one featured above. Previous Post Swarovski Crystal Pearls will never lose their color and luster, some colors have been discontinued – take a notice!